Galerie de Pieter, Leiden, The Netherlands. 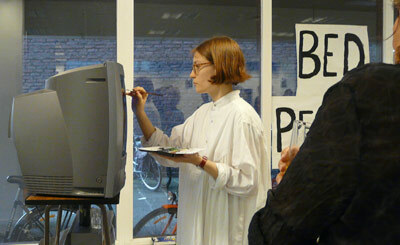 Performance: Carmen McGlinn + Toroa McGlinn. while Toroa plays one of his own compositions. Videos on the right are: "Grains of Salt" + "Ablutions" by Sonja. a short film by Leiden artist, Coen van der Geest, "Ablutions" by Sonja. 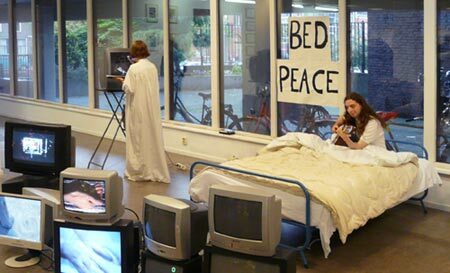 This performance and installation references Yoko Ono and John Lennon's 1969, "Bed-In for Peace" where for one week, March 25-31, they stayed in the Amsterdam Hilton Hotel and invited the press. 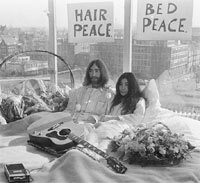 The first day of their honeymoon "sit-in" in the presidential suite (Room 902) at the Amsterdam Hilton Hotel, March 25th 1969. The press was invited into their hotel room every day between 9 a.m. and 9 p.m.
Photo is cropped from: Wikipedia. 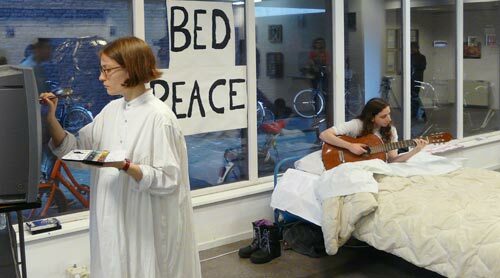 "Bed Peace 2013" is a different form of staging because the protagonists are not engaged in a 'sit in' (a form of protest) and the bed itself is staged in a gallery. They sit in bed during an opening of an exhibition but both then proceed to be the protagonists in their own activity. If there is any form of protest, it could be the reference to the text "PEACE," a message also visible to any one using the alley next to the gallery situated in the old post office in the centre of the city. Here the art gallery context creates a pun on the word 'piece' where as in the Hilton Hotel, the pun was underlined by the second text "HAIR PEACE." 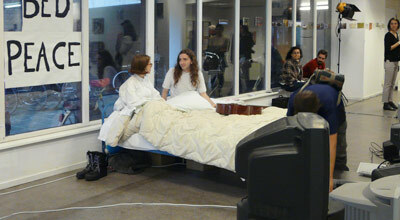 It is 2013 and the performance is both a referencing of the past and the contemporary. The bed is surrounded by televisions and computers, some old, some new. Films either by artists also in the exhibition "film + kunst" or a selection from the "Leiden International Short Film Experience" were played. 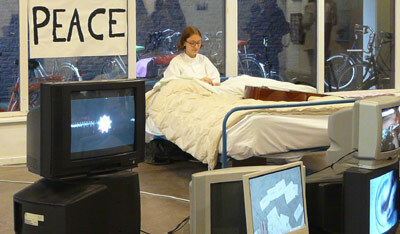 The monitors placed at the end of the bed, functioned as another form of 'in between' staging. Viewers could ask themselves if the arrangement was sculpture or an assemblage, a comment on the 'frame' or a reference to the work of another pioneer of conceptual art, June Naim Paik.